Supply and demand graphs is one of the most used tools in Economics. It depict the equilibrium between suppliers and consumers. The graph is an intersection of two curves mapped against quantity and price. Demand curve has a negative slope as consumers are willing to pay a higher price for a low quantity of goods. As the price declines, the quantity demanded increases. Suppliers, on the other hand, are willing to supply a large quantity at a higher price and a low quantity at a lower price. 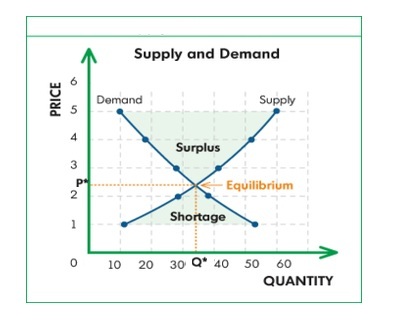 This entry was posted in Finance, Functional Strategy and tagged supply and demand, supply and demand chart, supply and demand diagram, supply and demand equilibrium, supply and demand graph by admin. Bookmark the permalink.